Graeme McDowell is gutted that he’s missed the cut on his Hollywood debut. The Ulsterman made a cameo appearance in the hit TV show Entourage just days after his US Open win at Pebble Beach. But his acting debut was cut from the season-ending episode of the HBO hit series. McDowell confessed: “I am going to have to admit it. I ended up on the editing room floor. Bummer. McDowell heard the bad news in a call from from the show’s producer though he’s still hoping for a second chance. He explained: “The producer Doug Ellin called me and said that it was such a last minute thing and the episode was such a serious episode that my scene didn’t make it. Considering he’d had less than five hours sleep, the new US Open champion was remarkably sharp. Then again, that’s no great surprise. 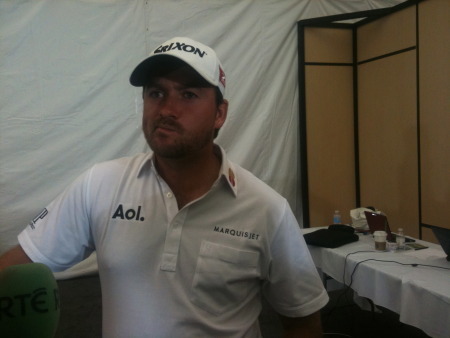 Half the golfing world knows by now that Graeme McDowell is one of the sharpest guys on tour. But he’s kept that way by his entourage. Graeme McDowell rehearses his swing during the second round of The Open. Picture Eoin Clarke www.golffile.ieOfficially it won’t go down as his sixth missed cut from his last 10 starts but a four over 76 meant Graeme McDowell missed the 54-hole cut int he RBC Canadian Open.